Following right on the heels of the 4th Headhunter DLC Pack (Mad Moxxi and the Wedding Day Massacre) is the announcement, with images of the 5th and final Borderlands 2 DLC- Sir Hammerlock vs. the Son of Crawmerax. We have to prepare ourselves for some rest and relaxation in a sunny getaway at an island resort when things go awry. Of course you're with Sir Hammerlock when the son of Crawmerax seeks vengeance on the original Vault Hunters and all hell breaks loose on Wam Bam Island. Sun, sand, shooting and looting. What more could we ask for? 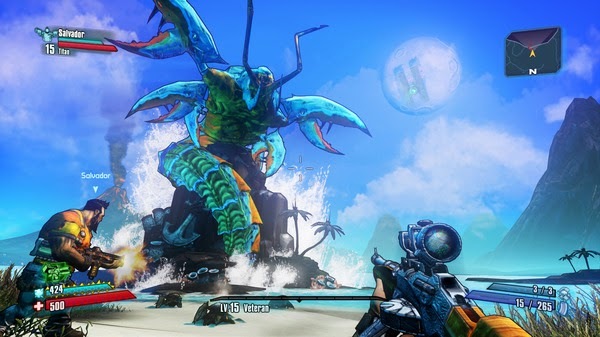 "Your journey across Wam Bam Island culminates in a battle against a foe that may look familiar to some – Crawmerax Jr., the son of the great crab worm from The Secret Armory of General Knoxx add-on for the original Borderlands. Crawmerax Jr. is seeking vengeance on Lilith, Brick and Mordercai for brutally defeating his father over and over again. You must fight him off without their help so, you may want to call some friends to help you out with this one. If you are successful in defeating Crawmerax Jr., you get the honor of wearing his head – but shrunk down to fit on your character’s neck since you aren’t an 80 foot crab worm. 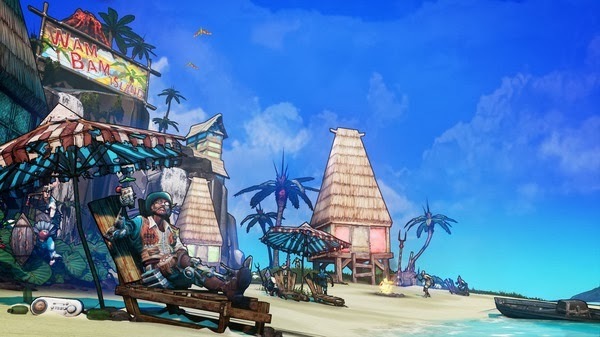 Each character gets a new beach themed skin as well, including Axton wearing an 80’s Aloha shirt and a certain dual gun wielding Vault Hunter prepping for a wet t-shirt contest. Oh, and make sure to bring your sun screen!" I like how Craw Jr. is mad about the Vault Hunters defeating Crawmerax Sr. "over and over." That would mean that the non-canon New-U stations may be fit into canon. Granted, it could just be a nice little joke for the fans. It is an amazing thing to still be receiving new DLC a year and a half after the main game was released. I look forward to the future of this series, and hope this particular Headhunter Pack lives up to the Secret Armory of General Knoxx DLC in terms of replayability. Sir Hammerlock vs. the Son of Crawmerax will be available April 15th for $2.99(USD).